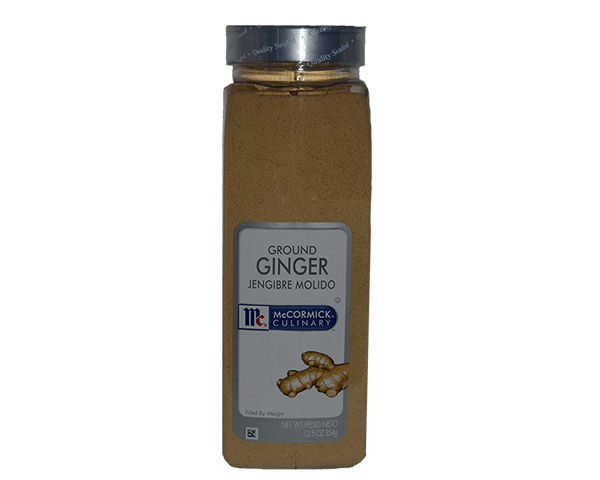 McCormick Ground Ginger is the ground dried root of the ginger bulb. The flavor of Ginger is characterized by its unique combination of lemon/citrus, soapy and musty/earthy flavor notes. Ginger is warming to taste. The color of the outside of fresh ginger bulbs is a pale yellow color but internally Ginger is buff-colored. Ginger is noted for its pungent flavor. Ginger is the dried, hand-shaped root of an attractive flowering plant, the herb Zingiber officinale. The root is knobby, branched and off-white or buff colored. 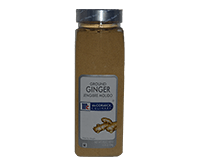 For the packaged ground Ginger, sulphur dioxide has been added to help retain color. Ginger has a hot, spicy flavor that can be put to good use in an endless variety of dishes. It has a special affinity for fruit dishes and enhances a wide variety of meat, fish and vegetable dishes. Try Ground Ginger in marinades of citrus fruit, garlic, soy sauce and onion for use with poultry and meats. For quick cooking dishes, use ground Ginger to release flavor quickly. Ginger is an important ingredient in the cuisines of Chinese, Caribbean, Indian, German, Thai, Scandinavian, North African, Indonesian and Latin American cooking. Braised Eggplant w/ Ginger and Soy Sauce More Recipes..